It is a big phone with a 4.3 inch screen. The materials used are of good quality. It has been used metal as main material and this gives the impression of solidity. There are no creaking joints even if you squeeze the phone in your hand. The button for start / stop and lock / unlock of the touch screen is disposed on the higher side of the phone. Beside him you will also find the 3.5 mm jack. On the left side of the phone the microUSB port for HDMI are masked. On the right are positioned the volume control keys and a small button to activate the 3D function. The battery cover opens easily. They put a small dwelling at the base of it. You will also find there the SIM card slot. On the back side you will find a portion of metal and two 5-megapixel camera with LED flash between them. The screen is a 4.3 inches 3D LCD with a resolution of 480×800 pixels with 16 million colors. The screen gives you a good view but the sun brings a mirror effect which becomes annoying, but so are most smartphones. The 3D menu, applications or content created in 3D are seen with the naked eye. You will have to find a suitable viewing angle but for long term it could become annoying. Three-dimensional effect is truly impressive even if is a small diagonal display. The sound comes from behind at smartphone base. It sounds strong and clear. It brings a dual-core processor clocked at 1 GHz, PowerVR SGX540 GPU, 512 MB ​​RAM, 8 GB of storage and microSD up to 32GB. The graphics accelerator is one of the most powerful from market with Andreno 220 or Mali-400mp. 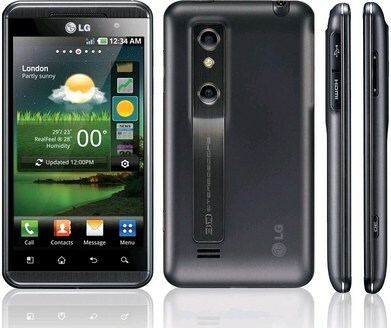 It runs Android 2.2 Froyo but LG has promised an upgrade to 2.3 Gingerbread. 3D is only available in landscape mode. You can make screenshots very easy by pressing the power button and concomitant to the menu. In browsing is very fast. Unlike the competition it brings an HDMI connector besides to 3G speed up to 14.4 Mbps, Wi-Fi b / g / n, DLNA, microUSB, 3.5mm jack, Bluetooth 2.1, Wi-Fi hotspot. QWERTY touch keyboard allows writing messages in portrait mode without accidentally typing other letters. This smartphone comes with two photo cameras of 5 megapixels.In camera menu you can switch between 2D and 3D. The 1500 mAh battery shows its limits in 3D mode. It makes sense. Last a day if you do not over-zealous in 3G access, Wi-Fi, GPS. It has 168 grams and 11.9 mm thick.